How to Winterize Hardy Banana Plants? Banana plants are hearty growers. If a plant is diseased or doesn't meet the gardener's expectations, it needs to be killed. Unlike other plants, banana plant roots are very hearty and will sprout suckers and regrow the plant if it is cut down. To kill a banana plant, additional actions must be taken. Apply 200 ml of kerosene to the tree's base. Lightly pour the kerosene into the ground to ensure it is picked up by the roots. The tree will die in five to seven days. Carefully chop down the tree, layer by layer, beginning with the leaves to avoid harming any structures in the area. Completely dig up and chop up the root, and discard it in a trash recepticle. If any of the root is permitted to remain, a new plant will sprout. Plant the red Abyssinian banana tree in a sheltered area with full sun and well-drained soil. The plant needs protection from both wind and frosts. It may be best to plant the tree in a tub and bring it inside for the winter or particularly stormy days if you cannot provide adequate protection. Water the plant regularly after planting, keeping the soil evenly moist. Do not soak the soil, however, as this will inhibit the growth of the plant. Even after the red Abyssinian plant is established in the ground it needs consistent, even moisture. Fertilize the Abyssinian banana with a banana fertilizer. This may be difficult to find in stores. Alternatively, look for a fertilizer with the numbers 6-2-12 on it. This means that the fertilizer contains six percent nitrogen, two percent phosphorus and 12 percent potassium, with other fertilizer products within. Any numbers close to that ratio will do the trick for this tropical banana plant. Follow the directions on the package for application instructions. Place the banana peels onto the cutting board, and coarsely chop them into 1-inch pieces with the utility knife. Gather the chopped banana peels in the bowl or bag, and carry them out to the garden. Dig a small trench around your plants with the trowel, spacing the trench approximately 6 inches away from the plants. Make the trench about 2 inches deep. Sprinkle the chopped banana peels evenly around the prepared trench in a single layer. Cover the banana peels with soil, and pat the soil down firmly over the banana peels. Water the soil area around the plants generously to help the banana peels begin to disintegrate in the soil. Banana plants need large amounts of potassium to grow and produce bananas, but specialty potassium-rich fertilizers are expensive. An inexpensive way to give banana plants added potassium is to bury banana skins around the base of the plants. The phosphorous in the banana peels helps grow stronger roots so the banana plant can better utilize nutrients in the soil. According to Reader's Digest online, there are two ways roses benefit from banana skins. The first benefit is that burying banana peels around the rose bush helps deter aphids. The second benefit is that as banana peels decompose, they release potassium and phosphorous into the soil to feed the rose bush and help it bloom. It is not just an old wives' tale that if you put small pieces of banana skin into the cup of a bromeliad, it will bloom better. Bromeliads take in nutrients not only from their roots, but through the water in the cup of the plant. The phosphorous and potassium in banana peels feed the plant and encourage blooms. Household dust clogs the pores of house plant leaves so they can not breathe. Use the inside of banana skins to clean and shine house plant leaves. Bury chopped banana peels in the soil to feed blooming houseplants. Do not use this method on plants with hairy leaves. Banana trees need adequate watering, warm temperatures and lots of bright sunlight. Most varieties require at least 12 hours of bright sunlight each day. Folding of the leaves, or a pale green or yellow leaf color is a sign that the tree isn’t getting enough water. Lack of adequate water may result in a lower yield in the number and size of fruit. Shade will delay plant and fruit growth. If the tree has small or stunted fruit, it is most likely suffering from a lack of sunlight. Place plants in full sun to maintain health. In periods of high humidity and too much rain, banana trees can develop a fungus on the leaves. Treatment with a fungicide is usually indicated. 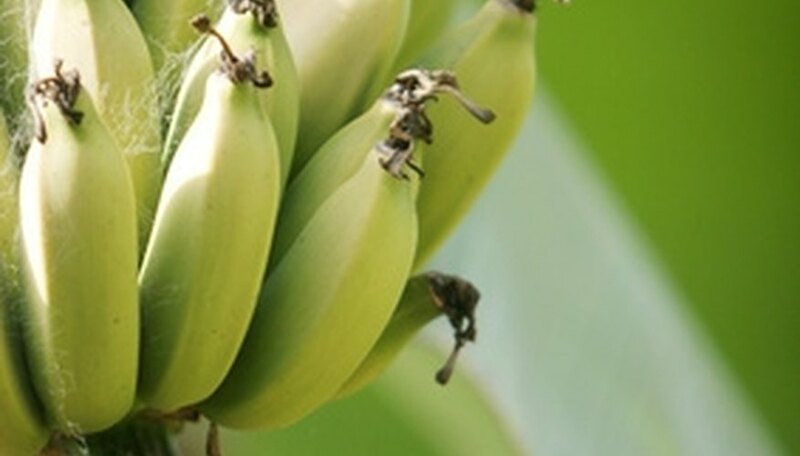 Banana trees are extremely susceptible to damage caused by flooding and stagnant water. Yellow leaves are a symptom of over-watering. Avoid planting trees in low-lying areas. Search for a full-sun location for your banana tree. 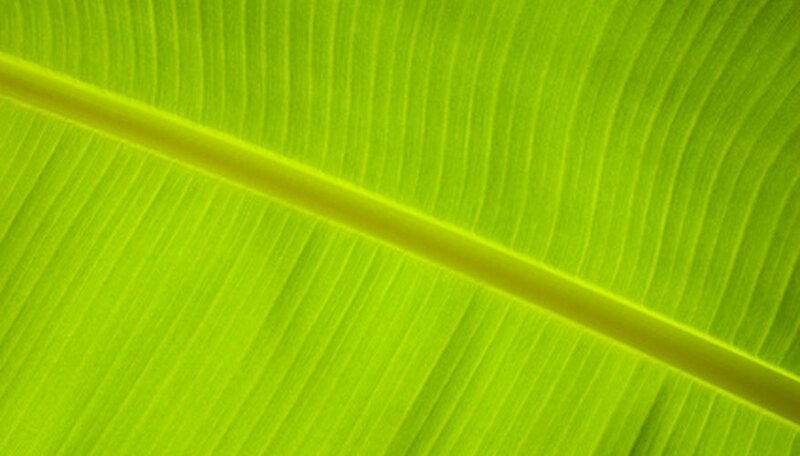 The ideal site will provide both full sun and protection from wind, since heavy winds can damage the banana plant leaves. Prepare a raised bed for your banana tree. MG Online advises mixing rich soil and coarse sand in equal parts to create a 1 to 2 foot high raised bed for planting. This rich soil mix will help keep your soil well draining, which benefits the banana tree. Dig a hole with your shovel once you've created the raised bed that is twice as large as your banana tree rhizome. Plant your rhizome in the prepared hole and cover it over with soil mix. Water the area until the soil becomes saturated. The rhizome will grow underground for a while and then begin to shoot up a stalk for your ornamental banana tree. Break up into smaller pieces any uneaten banana, as well as the banana peel. Place and store your uneaten banana and banana peels in your compost pail, a tightly covered storage container or an outdoor container. Mix your banana pieces into your compost pile, bin or vermicomposter, spreading the pieces out for faster composting. Test your soil's pH and nutrient content, using a test kit. Nutritional needs will vary with soil pH. Whenever possible, adjust soil pH to between 5.5 and 6.5. Fertilize newly planted bananas with 1/2 lb. of dry 8-10-8 fertilizer when the plants begin to emerge. Sprinkle the fertilizer over the mat and between the stalks. Feed the bananas two months later, spreading the fertilizer about 1 foot away from each plant. Feed a third time in another two months, this time spreading the fertilizer farther out, approximately 2 feet away from the plants. Feed mature plants every two months, using 1 to 2 lbs. per mat for plants over six months old. Increase to 2 to 3 lbs. for mats between 12 and 18 months old and 3 to 4 lbs. for mats over 18 months old. Apply a nutritional spray containing manganese and zinc once or twice a year. Apply an iron supplement to the soil once a year in areas with iron deficiencies. Iron deficiencies will be indicated in the soil test. Cut the stalks of the banana plant back to the soil at the end of the growing season to reduce the amount of energy the roots need to expend during the winter. Water the soil so that the roots are covered with 1 or 2 inches of moisture. Winters have drought-like conditions, which will dry out the banana plant's roots. Do not over-water as banana plants are susceptible to root rot. Place a thick layer of peat moss over the top of the banana plant soil. Cover the peat moss with a sheet of thick plastic to retain moisture in the soil and prevent the soil and roots from chilling over the winter months. Drive a sharp shovel into the soil between the daughter sucker and the adult plant stem. This will cut the sucker free from the main system. Move your shovel to the outside of the sucker about 2 inches away and drive it into the soil. Lift the shovel up gently to free the sucker from the soil and the mother plant rhizome. Grasp the daughter sucker with your hands and wiggle it free if it is reluctant to come out. Prepare the soil by digging a 4-foot-deep hole and filling with equal amounts of natural mulch, potting soil and perlite pebbles. Natural mulch adds acidity, moisture and nutrients to the soil, encouraging fast growth of the tree's roots. Potting soil contains additional vitamins necessary for vigorous growth and overall plant health. It is also free of any diseases that may have been present in the natural soil. Perlite pebbles provide texture to the soil, encouraging proper drainage. Water the tree daily while it is establishing its root system. After the first two weeks watering can be decreased to whenever desired. For the best results, the tree should be watered at least every three days. Fertilize using a quick-release fertilizer every three to five weeks. Red bananas respond well to fertilizers, so routine fertilization is a must for fruit production. Choose a dwarf banana tree. Super Dwarf or Dwarf Cavendish, Dwarf Red, Dwarf Brazilian or Raja Puri are suitable varieties for indoor growing. Purchase high-quality potting soil. It should be porous and well-draining, with a pH between 5.5 and 6.5. For best results, mix 3 parts potting soil with 1 part sand. Repot the banana plant into a larger container. The new pot should be deep enough to completely cover the roots of the tree and allow for adequate water drainage. Do not cover the corm completely; the top 20 percent should be uncovered until the plant has several bigger fronds. Place the pot in a room that receives six to eight hours a day of indirect light; you can also use an artificial grow light. The room should stay above 60 degrees F and be free from drafts. Water the plant thoroughly. Do not worry about overwatering your bananas as long as the pot can drain and they are not standing in water. Fertilize once a week for maximum growth with a water-soluble, 8-10-8 fertilizer. Schedule the planting for spring or early summer, when all danger of frost has passed. The banana pepper does not tolerate severe colds and the leaves may shed when the temperature drops below 55 degrees F.
Prepare the soil with a starter fertilizer, following the application instructions provided by the manufacturer. The soil should be well-draining and moist. Plant the banana pepper plants, gently removing from the container and digging a hole slightly larger than the mass around the roots and soil after removing from the container. Carefully set in the hole, maintaining the soil line and back filling to fill the hole. Space the plants about 2 feet apart in the row, with the same spacing between rows. The optimal temperature for banana trees is 76-86 degrees F and high humidity. Frost kills above-ground portions of the tree while high temperatures with no irrigation stunts growth.